Items in GatherContent are quite different from a traditional document, so it can be useful to know some of the details before you get started. How is an item structured? Does GatherContent have a spell checker? To add content to an item, the item first needs a structure or template. If your item doesn't yet have this, check out our article on adding structure to an item. When your item has a structure or template applied, you'll notice that the item is broken down into a series of fields, which allows the content to be broken up into smaller chunks. This is where you create your content. Each field has a label, some field guidelines, and may have a word or character limit. This helps authors write the content you need in the format that's needed. The field type and field label let the author know what content is required to be added to this field. Instructions underneath a field provide extra clarity. As you're typing, you'll notice that the content is regularly being saved. You can see this at the bottom-right of the item. 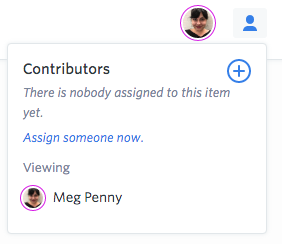 You can collaborate on an item in real-time with your team. If anyone else is editing the item, you'll see their circular avatar shown at the top right. 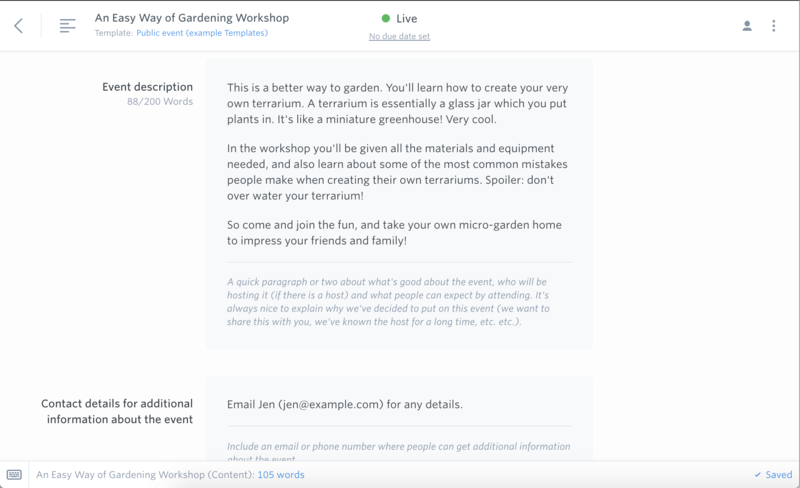 If you're writing in a rich text field on the item, you can format the content. The formatting toolbar appears when you highlight the text, or double click next to some content. Tip: The formatting toolbar will only appear once you've entered some content into the field. You can select different heading styles, as well as bold, underlined, italics and strikethrough. There's also a clear formatting option to remove any currently applied styles. Any content that you paste into a GatherContent field will have the unnecessary styling removed, so you're left with content with clean HTML applied to it, ready for export into another system. By selecting some content, GatherContent lets you know which styling is currently applied, as shown in the bottom bar. Add en and em dashes to your content by typing two hyphens (--) and three hyphens (---) respectively. This is only supported in the newest version of GatherContent. You can add a hyperlink to text using the formatting bar. Links are opened in the same window by default when added, but you can specify if you prefer to open them in a new window. All hyperlinks should be added with a http(s):// at the beginning e.g. If the hyperlink you set opens in a new window, it will have target=“_blank” and rel=“noopener no referrer” attributes in the HTML. These have been added to strengthen the security of the target="_blank"attribute. If you prefer not to have these attributes added to the HTML, we recommend to make your hyperlink open in the same window instead. 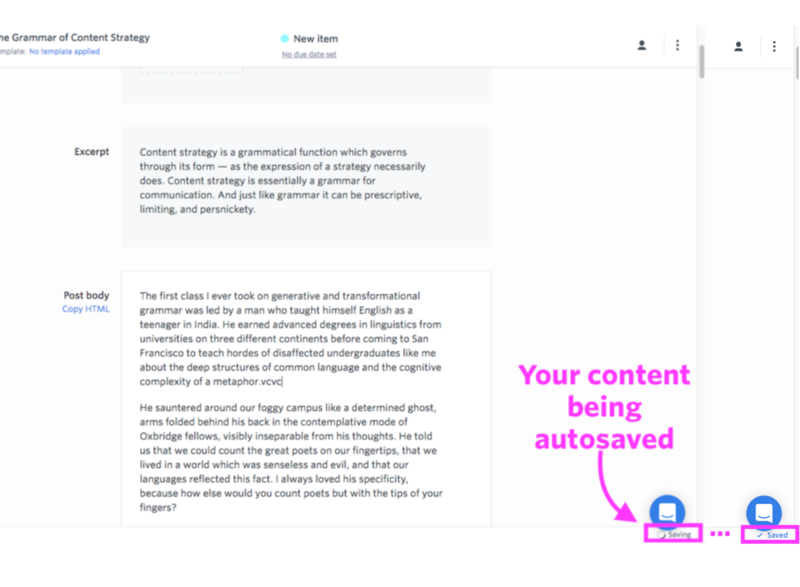 GatherContent does not have a native spell checking, autocorrect or custom dictionary function built into the content editor as they are all built into the browser you're using. You can update your spell checker, autocorrect and custom dictionary function in your browser directly, in order to use it within GatherContent.